Yu-Gi-Oh! 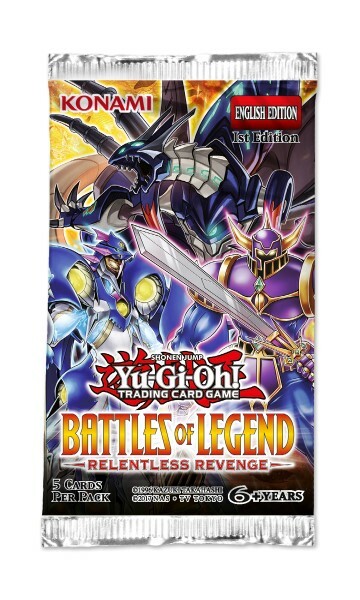 TRADING CARD GAME Battles of Legend: Relentless Revenge combines often requested cards from each of the Yu-Gi-Oh! animated series, printed for the very first time, including new cards from Yu-Gi-Oh! VRAINS, high-demand cards used in current competition, and cards targeted at Duelists who want to play with Deck strategies and themes released over the past year and into the next one! Yu-Gi-Oh! TRADING CARD GAME Battles of Legend: Light’s Revenge dug into the archives of cards Duelists thought would never see the light of day and produced the Timelords! These monsters from the climax of Yu-Gi-Oh! 5D’s proved to be an instant hit, and there are more where they came from in Yu-Gi-Oh! TRADING CARD GAME Battles of Legend: Relentless Revenge including the 4000 ATK and DEF Sandaion, the Timelord! The “Number” monsters that debuted in Yu-Gi-Oh! ZEXAL are a hit with Duelists and collectors alike, and Yu-Gi-Oh! TRADING CARD GAME Battles of Legend: Relentless Revenge brings more of them to your Dueling table! Duelists regularly find room for Number 38: Hope Harbinger Dragon Titanic Galaxy from Yu-Gi-Oh! TRADING CARD GAME Premium Gold: Infinite Gold for its Spell negation abilities, and now it’s getting a “Galaxy-Eyes” counterpart that negates monster effects! To top off this 105-card set, return to the original Yu-Gi-Oh! animated series and experience the power of a card so overwhelming, it was never meant for our hands! You can find all this, plus cards from Yu-Gi-Oh! GX, 5D’s, and VRAINS, and more in Yu-Gi-Oh! TRADING CARD GAME Battles of Legend: Relentless Revenge! Each 5-card pack contains 4 Ultra Rares and 1 Secret Rare.